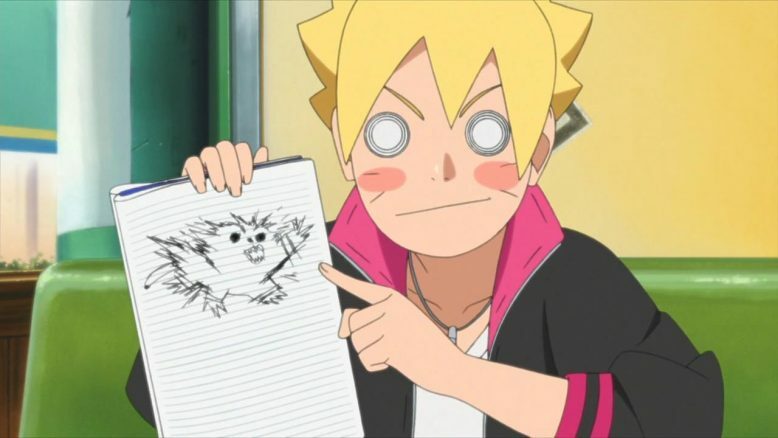 With growing concerns of Boruto being too kid-centric, the show follows up last week’s episode with…. this? Uhh… I’m not really sure what tone or age group the show is going for now, because it feels like its in a rather odd space. I mean, this week’s episode oscillated between unsettling and “we can all be friends!” in a manner that just felt weird and obtuse. 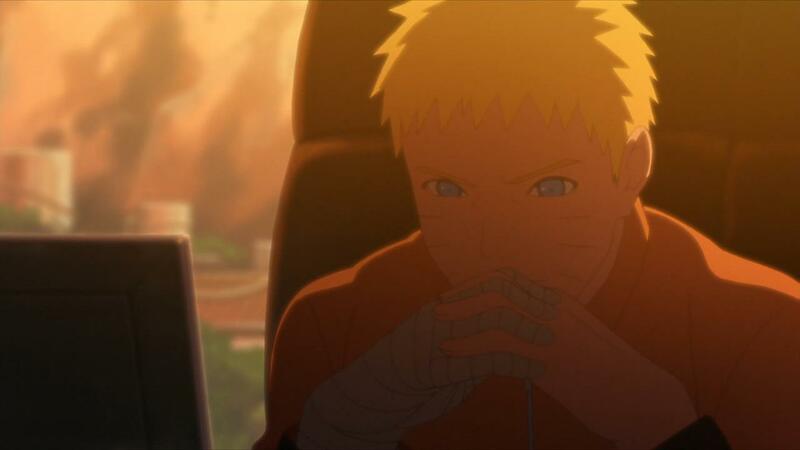 And if I were being truly honest, the almost bi-polar nature of this week’s episode really did make me wonder about whether this new Boruto series can actually establish its own tonal identity. Tone, really was the element that felt all over the place this week. We started innocently enough, with a middle school boy following a girl he likes around. Kids do that sometimes, they’ll unintentionally do something really creepy, because they don’t know better. Stalking itself, however, is not something that is really funny, and as anyone who’s been involved in a stalking related incident can tell you, its not pretty. Cho-Cho – Putting her friend and her stalker in an akward situation…. It made sense to me that Cho-Cho, being as inexperienced as she is, would resolve the situation in the way that she did in the start of the episode. It was pretty clear that as soon as Maguire had started stalking, he had already lost any semblance of a chance. The issue really was for him to stop and change himself and move on, rather than confess his feelings right there. Its all played for laughs of course. 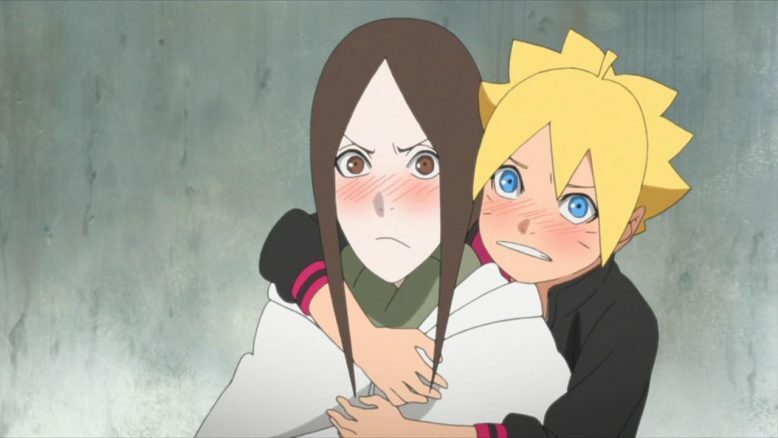 Boruto acts like a bashful romantic, and can hardly believe he’s seeing a confession. Maguire, for his part, DOES actually confess right there and then (Even though common sense really does argue otherwise), and then he of course gets rejected and storms off like the child he is. Everything’s fine until that point. Its a representation of childish immaturity and stupidity that so many kids do have, and its not a bad topic to show off, especially in the context of a Ninja world like Boruto’s. The fact that Maguire can literally turn himself invisible, adds a unique dynamic to an otherwise very common story, and if the show had just left it at this, I’d be a lot more okay with it all. Where this episode goes wrong, however, is when it takes the stalking angle too far and starts making it all extremely creepy. The writing on the chalk board, the almost horror-esque tormenting that Sumire starts undergoing because she “rejected” Maguire, is flat out disturbing. Its not the sort of stuff you’d see in a kids show, and I’d argue that its something that’s a bit too heavy handed for something like a kids show. Which, you know, is fine, a little whiplash can be interesting for sure. Or rather it should have been fine if not for the tone and vibe of the entire show just crumbling at around this point. Look, It makes sense that Maguire is doing these twisted and horrible things because he’s under the influence of the Purple Chakra. Everyone goes crazy and even Jounin level Ninjas can hardly resist it. The thing that breaks it all down, though, is Cho-cho’s whole potato chip on the shelf analogy, that not only is terrible to the point of being silly, but said analogy actually resolves the whole matter, which is borderline nonsense. We have Boruto and Shikamaru fighting for their lives, and Cho-cho just rushes in and starts talking about Potato Chips and shelves and how they represent the idea of love and life. Its supposed to be a silly little joke, but all it feels like is just horribly out of place. 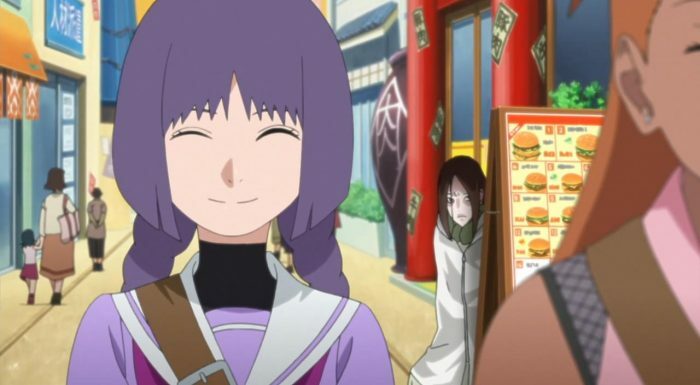 That’s more or less because the situation here is onewhere a deadly stalker boy is using his invisibility techniques to kill all of Sumire’s friends so “he can be alone with her”. Potato Chips aren’t just a snack, they’re a life style! I get what the show was going for here, because the point here is that Purple Chakra victims can just become normal if you solve their underlying mental hangup or issue. I get that, but the mix of comedy and creepyness just didn’t work, and pulled me right out of the experience with how brazen it all was. Cho-cho’s potato chip obsession is funny by itself, but when its thrown into the more serious parts of the show, it just shows a real sense of immaturity and inexperience in the writing here. The only times you’d get a tonal mismatch like this, would be in the filler episodes of the original Naruto series. Seeing it here, so early on, and as part of the main story, is really starting to make me wonder about Boruto. 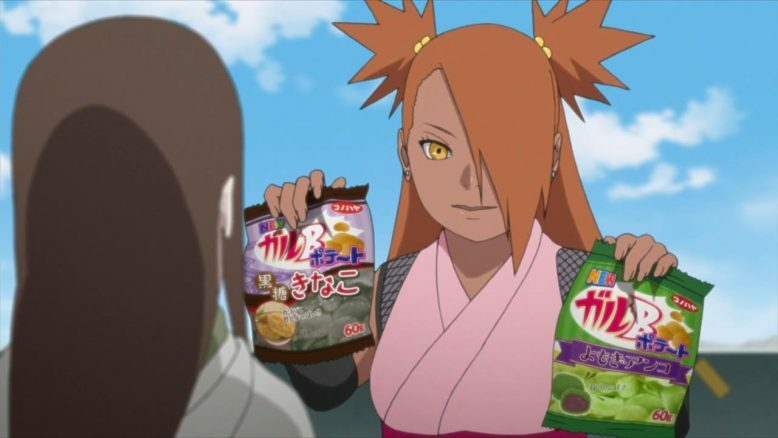 The special sauce from Boruto feels like its missing. The stuff we saw in Boruto’s movie, was probably what Kishimoto himself imbued in the story. We’re just not getting something that’s on the level of Naruto anymore. It doesn’t have to be the same kind of story, but it has to feel as good on its own terms. While Boruto definitely started on a promising note, its starting to feel like more and more of a mediocre show. I’m not sure if that’s part of the source material (since there is a Boruto manga), or if the anime is just stretching things to the point where we’re getting these weird misses again and again. First Shino, now Maguire. 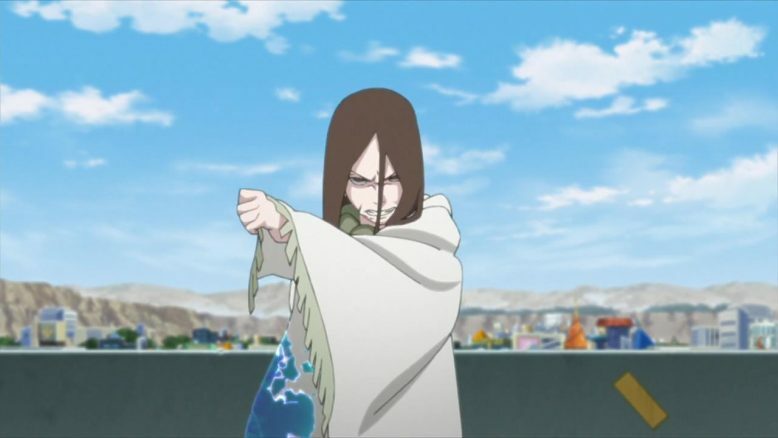 The big problem that Boruto has it that the story just doesn’t have a solid antagonist. A villain is something that we’ve been lacking since the show started, and the lack of said villain is really starting to hurt the show. Its not terrible yet, but the show has made the transition from “decent” to “mediocre” in the last two episodes. There’s still time to turn things around, as we’re only about seven episodes in, and have only had about 2 real duds. 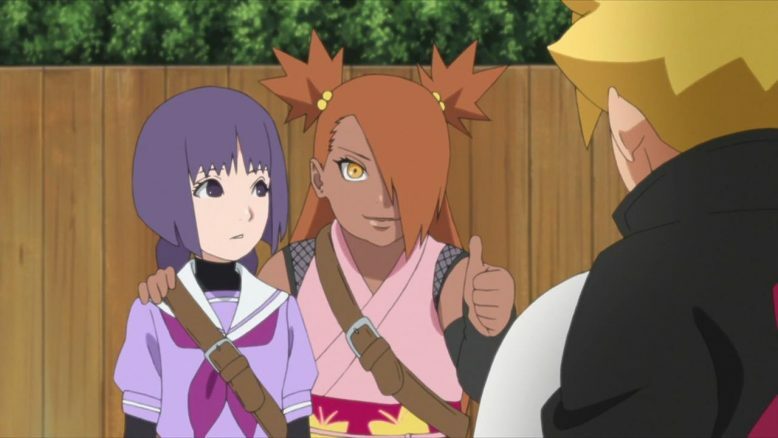 Boruto needs to get back to the basics, and dial back on the kid slice of life stuff that its frankly not all that great at. Hopefully in the coming weeks we see a course correction, or Boruto may very well become a sequel that’s nothing more than a disappointment.